I love cooking with my Grandchildren, and one of the things we make is rocky road candy. 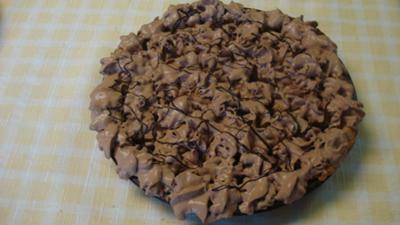 One day when we were in the kitchen my Granddaughter Emily said, "Wonder what a Rocky Road Pie would taste like?" We decided it would be yummy and started on our search to come up with a Rocky Road Pie. What a great task!! Hope you like it as much as we do. Combine chocolate pudding, marshmallows and walnuts and pour into Oreo pie crust. Cover with clear wrap and chill for at least 1 hour. Before serving top with chocolate whip cream and drizzle with chocolate syrup.